On July 14 there was a special election to fill the 32nd congressional seat in Los Angeles being vacated by Obama's Labor Secretary appointee Hilda Solis. 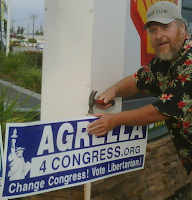 Libertarian Chris Agrella won 5.2% (1,356) of the votes as Democrat Judy Chu demolished Republican Betty Chu by 62% to 33%. The last 3-way election in CD32 was 2002, when the Libertarian got 3.7% and the Republican got only 27%. This was the first time in the last 30 years that an alternative CD32 candidate had broken the 5% barrier against R and D opposition. How did Chris do it? Here are some of the ways. Chris and nearly a dozen volunteers pounded the pavement to distribute 4000 campaign cards (at right) donated by Brian Holtz and Zander Collier. 600 of the cards were distributed as individual door hangers, using precinct lists provided by Perry Political Software. Chris placed 300 campaign signs at intersections around the district. The Libertarian National Committee arranged for a first-rate campaign site to be developed and maintained for Chris. Chris worked events like the L.A. Pride Festival and a candidate forum, and addressed three city councils. LPCA HQ hooked up Chris with an interview on Fox Channel 11. Words and e-mails will not be able to truly express my gratitude to all of those who helped me with my run for the 32nd congressional election ending this July 14th. But consider this a much appreciated thank you for all who helped with all the activities that were done in order to get the message out to the voters that there was a choice, once again, to vote their conscience for their representative in Congress. And a very, very, special thanks to all of you who did the ultimate conviction, that being giving your hard-earned money as a contribution to this campaign to help me run a much more noticeable candidate name recognition in display signs, flyers, and the like. It would have never been possible if these funds had not been received! In looking forward, we now have a good base of ideas and plans that can be used to further anyone wishing to be a candidate for any position, and I encourage anyone to do this and run for an office, and with these additional aids, victory will be achieved!